Real Madrid forward Cristiano Ronaldo says he will not leave the club before his contract expires in 2018. The 31-year-old Portugal captain has been continually linked with former club Manchester United, who sold him to Real in 2008, and Paris St-Germain. "I want to stay here two more years. The two years I'm talking about take me to the end of my contract," he is quoted as saying by AS. "And the future, we'll see." 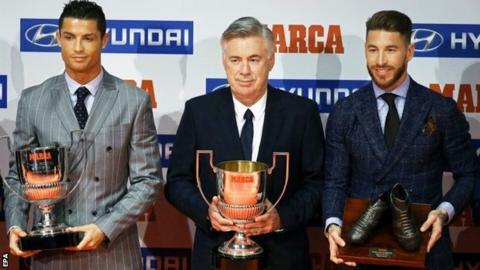 Ronaldo was speaking at an event to collect his Pichichi trophy, which he won for being last season's La Liga top scorer with 48. "This is the best league in the world, although I also played in the Premier League," he said. "It's fantastic, competitive, and with great players. It is a privilege to leave my mark on it."